Ideal to use as a reflection worksheet in the classroom. Children record two stars and a wish from their learning experience. Print a copy for each student in color or black and white. Alternatively, print and laminate a class set to used over again with a removable marker. After a specific learning experience, ask the children to use the worksheet to record two things they liked about their work and one thing they could improve. 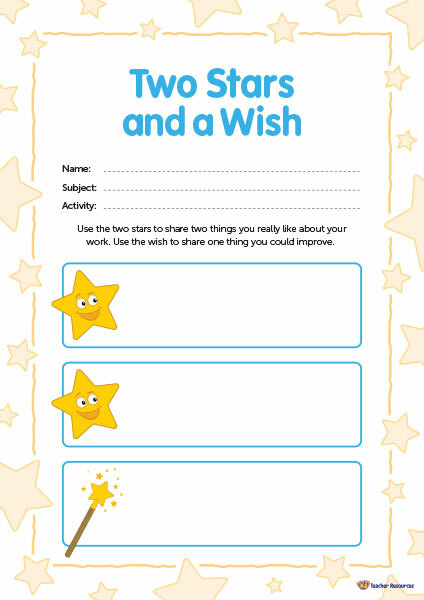 Encourage the children to share their stars and wishes with their peers. What comes next? – Use the information from the children to cater for personal needs in future lessons. This resource is available in each school font and as an editable Microsoft Word version. Use the menu below to select the appropriate version for your class. I’d really like to use this resource as an end of year reflection with my Pre-primary kids. Is it possible to get an editable version? If that’s not possible could I please get it in SA font? We have now created this resource in all school fonts and as an editable Microsoft Word version. We hope your students enjoy using this resource in the classroom.